Well I finally made a commitment to the grandkids Valentine treats. This cute box was made to carry them in. Box file - SVG Cuts "Big Boutique Boxes"
Face - PKS 486 "In Stitches Face Assortment"
Ribbon is from Hobby Lobby (not sure of the brand). I made the bow just by twisting short pieces of ribbon and hot gluing them. Boxes - SVG Cuts "One-Piece Boxes"
TGIF my crafty friends. 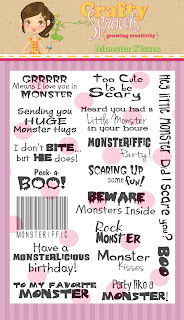 Today is Feature Friday over at Crafty Sprouts and the awesome stamp set we are all featuring is "MONSTER KISSES". This is such a fun set for many different occassions. I have used it on a baby layout, a Valentine treat holder, Halloween cards and treat holders and now a birthday card. The Case Challenge is also still going on at Crafty Sprouts so head over and check it out. I cased my wonderful friend Jess and her cute step card HERE. all other cut files are from the Rock Princess cartirdge. Yeah it's the first Peachy Challenge of the year. I made this card for our neighbor and church friend. Have you all checked out the new PKS Stamp of the Month Club. I debated for so long but my fellow DT sisters were joining and I just couldn't be left out on all the fun. This cute little heart and face are both in the January set. We got a sneaky peek of the February set and they are just too cute. 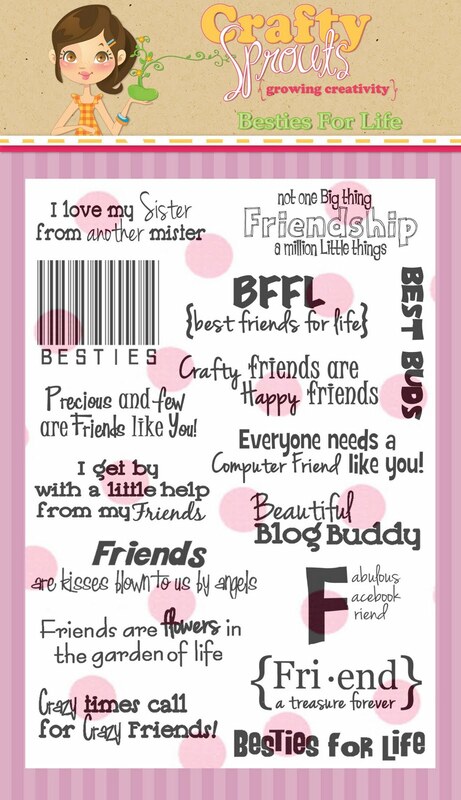 The sentiment for my card is from Crafty Sprouts "Besties For Life". This set is so fun to use for so many different projects. 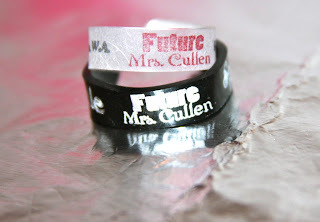 Go check it out in the Crafty Sprouts Shop. I have been in the Valentine spirit lately so I made the grandkids lunchbox notes with a Valentine vibe. For my granddaughter's card I used the little heart from the new PKS Stamp of the Month and one of the cutest little faces from this same set and some twine from The Twinery. 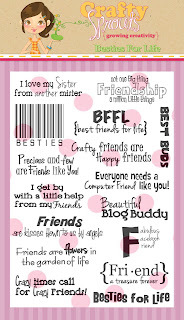 The sentiment is from Crafty Sprouts "Text Talk" stamp set. 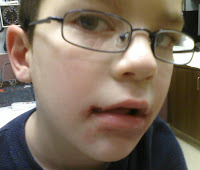 For my grandson's card I used Hero Arts Framelits "Bicycle" and a PKS "In Stitches" face. The sentiment is from Crafty Sprouts "Smile On" stamp set. I am sorry this announcement is so late. I had such a headache yesterday and spent very little time on the computer but I finally have a winner for the Crafty Sprouts Recap Blog Hop. I will email you tonight Rosie. Hello Crafty Sprout Friends. Thanks for visiting us for the past two weeks as we shared our projects and hoped to inspire you. Perhaps, we shed new light onto how to use Crafty Sprout sets, I mean did you see how the Totally Witchin set was used for a Valentine project. Talk about wow! We are here today to wrap up our Recap Event with a little mini blog hop where you will see new and favorite projects. If my awesome DT sister Kacee sent you over you are in the right place. If you just happen to stop by you really should head back to the super duper talented Erika so you don't miss a single awesome thing. I have to say that I have been so honored to be a part of the Crafty Sprouts Design Team and have been having the best time. Erika is the absolute sweetest person and the rest of the team have become such wonderful friends. My projects today are in honor of them. "Let's Go Blog Hopping" and "Besties for Life"
When I was thinking about this hop this song kept popping into my head and low and behold YouTube came to the rescue again. I totally love the "Oldies" and these guys are the cutest!! I am giving away a "Straight from the Nest" cartridge to one lucky FOLLOWER that leaves me some comment love on THIS post!! Be sure to leave a way to contact you in your comment. The winner will be drawn on Monday.Your next stop is the totally inspirational Carley. If you happen to get lost along the way here is our complete inspirational LINEUP. When you are done with the hop be sure to check out the Crafty Sprouts Shop for some super terrific stamp sets. It's not just for Halloween anymore. Today is another Crafty Sprouts stamp set recap. Today's feature is the Totally Witchin' stamp set. This set was totally perfect for these little Valentine treats. I so love how they turned out and I will positively be making more of them for school treats. These cute boxes are from SVG Cuts "Love Me Do" set. I hope you all have gotten some fabulous inspiration, during this recap, from my fellow DT sisters and some new ideas on ways to use these Uh-Maze-ing stamp sets in the Crafty Sprouts shop. It is so much fun thinking outside the box and coming up with new and fun ways to create with them. I hope everyone is having a "Totally Witchin'" day!! Happy Monday everyone. The Crafty Sprouts Design Team has been having a recap of all the awesome stamp sets and today is my lucky day. I am going to show you just how awesome the Crafty Sprouts "Monster Kisses" stamp set is and how incredibly versatile. This set can be used for so many different occasions. It is just too cute. My Peek-a-BOO mini card is going to be put on a layout for my baby granddaughter because she is just getting the concept of playing peek-a-boo and I thought it would be adorable. The BEWARE Monster Inside card is for my grandson because he is in the monster movie (not too scary though) stage right now. He analyzes the movies he watches and says "Oma that isn't real because it can't possibly happen for really real." lol He is too funny and wicked smart. 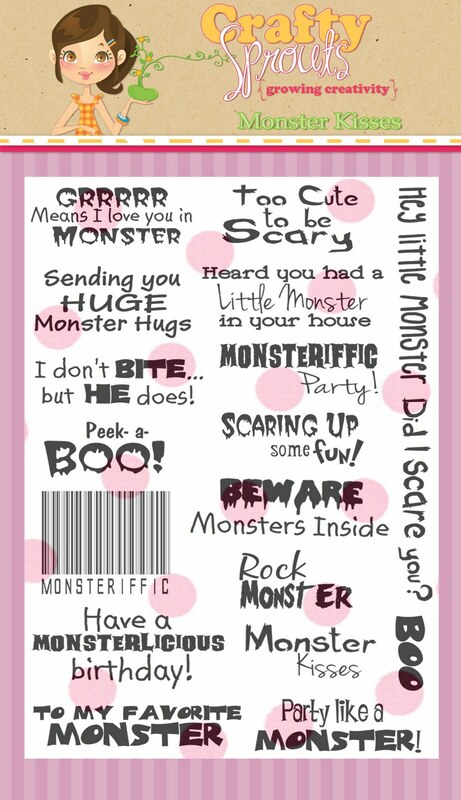 Last but not least is my Sending you HUGE Monster Hugs card. I haven't decided yet who is going to be getting it or maybe I will just send some Monster Hugs to myself or I might just surprise someone. Ya just never know. I am entering this card in Peachy Keen's LFIF Color Challenge. I hope you all have been enjoying this recap of all the truly terrific stamp set in the Crafty Sprouts shop. Have a great week and see you again soon.